No, not the ones that taunt Ebenezer Scrooge. But they can be the kind that, like the miser himself, will cause you to wake up with a promise to amend your ways. But hey, if your hosts have unlimited premium supplies you might want to mix-imize your efforts. Or, if you want my opinion, keep dry and take your friends home. New Year’s Eve is amateur night. Weddings are joyful occasions, but they’re also often fraught with emotional upheaval as adult children struggle to find their role in the family and come to terms with old resentments and tragedies from the past. In Rachel Getting Married, Kym is home on a weekend pass from a drug addiction recovery program to attend her sister’s wedding. Rude, self-absorbed and sarcastic, she immediately stirs up trouble and tries to shift the focus of the weekend to herself. She’s also obviously fragile and damaged and desperate for love and understanding. Rachel is hesitant to reach out to her – Kym’s addictions have had far-reaching consequences and led to a tragedy that tore the family apart. Yet the bonds of love and family, though strained and frayed, hold strong and by the time Kym leaves they’ve reached a deeper understanding of and love for each other. The various scenes of the wedding and the celebrations and events leading up to it are wonderful, often funny, sometimes heart-wrenching – a chaotic, multi-cultural extravaganza of music and traditions (the dishwasher-loading contest is especially funny) In the end, the lesson is that forgiving yourself may be the hardest thing you do, and that love can save you. Anne Hathaway earned a well-deserved Oscar nomination for Best Actress with her riveting performance of Kym. There are very few individuals who are famous enough for society to continue to celebrate them 200 years after their birth, but on February 12, 1809, two very famous men were born. One, Abraham Lincoln, is very familiar to Americans, as our 16th President. Another influential individual, born across the Atlantic on the very same day, was Charles Darwin. Though most people know that Darwin wrote about evolution in his On the Origin of the Species, there continues to be much controversy regarding this subject. So, why not use the month of February to find out more about both of these influential men? Drop by the library and see our displays on both! And check back here for continuing blogs on both of these birthday buddies. Hanukkah — for Kids & Cooks! Christmas is not the only holiday celebrated in December. The traditional Jewish Festival of Lights, or Hanukkah, is held this year from December 21-29. We have several books on the subject, many of which would prove helpful in explaining the subject to children. I Have a Little Dreidel by Maxie Baum is a colorful example. Not only does it tell you how to play the dreidel game, it also has the sheet music to the simple song repeated throughout the story. Plus, there’s an easy recipe for potato latkes as well- yum! Tastes of Jewish Tradition: Recipes, Activities & Stories for the Whole Family by Jody Hirsh (and several other authors) is a compendium of crafts, games, stories and menus for many Jewish celebrations, including Hanukkah. It is handily organized in an appealing spiral notebook, which also makes it easy to use. If you’re more interested in the culinary aspect, I would recommend Jacques Pepin’s Chanukah Celebration, a dvd with many traditional favorites prepared with a sophisticated French flair. It’s always fun to try a new recipe! As autumn fades and winter arrives, we look forward to the holidays of the season to brighten the cold and gray days ahead – from Thanksgiving to Super Bowl Sunday and beyond, there are all kinds of reasons and excuses to get together with friends and family. And to eat, of course! It’s easy to eat seasonally and locally in the summer when it’s sometimes difficult to keep up with the abundance, but Anne Bramley’s Eat Feed Autumn Winter shows you that not only is it possible, it’s easy and delicious to eat well in the colder months too. Recipes are arranged by festive menus, with the emphasis on non-traditional celebrations: Guy Fawkes Day, Greek Harvest, Afternoon Tea, Election Night Get Together, Spring Eve. 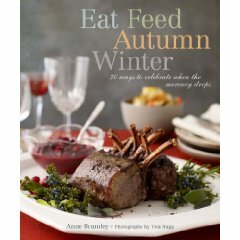 As well as the usual information on how to stock your pantry and cooking tips, Eat Feed Autumn Winter is liberally sprinkled with the facts and stories behind the events of the cold season from around the world. Don’t forget, the Davenport Farmer’s Market continues all winter in the Freight House on West River Drive! Don’t let winter get you down – instead, celebrate it with good food and good friends.